A finished WIP! 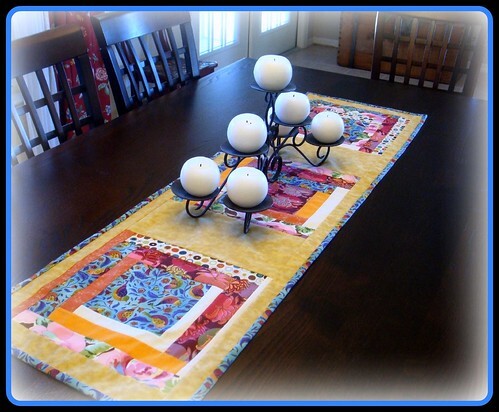 I'm keeping this table runner for myself. The colors in the top photo look a little bit off, they are much more like the one square I originally posted in the WIP post. 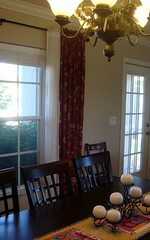 The table runner picks up the colors of the curtains, which are also in the adjoining living room. Right now I'm feeling motivated to make new pillowcovers for the couch in that room using fabrics in the runner. The runner was super easy to make. For the three blocks I just used a mix of scraps and new fabric cut into varied width strips and pieced them onto squares of white muslin. I then added the gold fabric, adjusting the pieces of that to get the overall length and width I wanted. The backing fabric is more of the gold. The dot fabric? Amy Schimler. I was so pleased with myself for sneaking some of that into this project ... it makes me laugh to see it here because I've used so much of that lately. Yes, I do need a life. The blue bird fabric is so pretty. It was the starting point for the runner, just as it was for the last runner I made. I think we may now have to dine at this table once in a while (we never ever do)! I love it!! 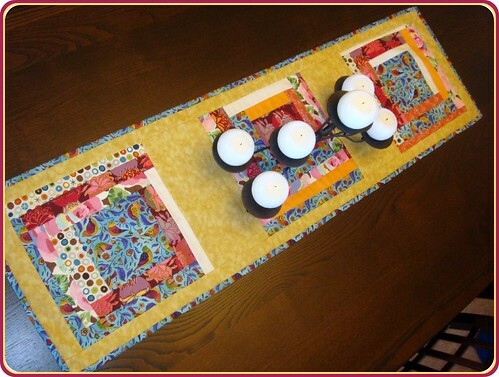 Lately I've really become to love the idea of a table runner. No need to take it off and wash it after every meal (with a toddler) like a table cloth. The colors are so bright and spunky. and yes...I'm a slacker and still need to send you the sling instructions. Hope you've been able to try it with the little man! I'll try to get that done today or tomorrow. this is beautiful! scraps can sure be amazing!!! love the little toes too.